Piper never fails to disappoint us. Always doing or saying something unexpected. Yesterday, my sister and her boyfriend came to visit us and after dinner we went outside to talk landscaping while the kids resumed bike riding. Chrissa and I were out back when Will came around the back of the house laughing. 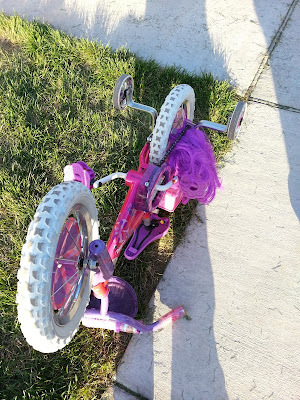 Somehow, Piper managed to get her purple wig stuck in her bike chain. Like REALLY stuck. Huh? Chrissa, being the bike expert that she is went to take a look at it and couldn't believe how stuck it was. All we could do was laugh because, I mean really, a wig stuck in a bike chain? And a purple wig at that. Not sure how we're going to get it out. Although it cements our decision to move Piper up to Caroline's old bike. I asked Piper later how it happened and she said, "Well, I put my wig in the baby doll seat on the back just to have it and it fell off when I was riding." Naturally. She was a little upset when I told her we'd probably have to cut it out and that the wig would be ruined. Then on Friday, Piper was playing outside with her friend Bella. They were getting the wagon out of the garage and Jason overheard Piper say to Bella as they were walking the wagon and scooter between the van and the Pilot, "Be careful not to hit that car [the Pilot], Bella. It's not paid off yet." Jason got a good chuckle out of that one. How did she know that??? Further, how does she know the van IS paid off? Is this something most 4 1/2 year olds know? Maybe we need to start discussing our long term investment plans with her.